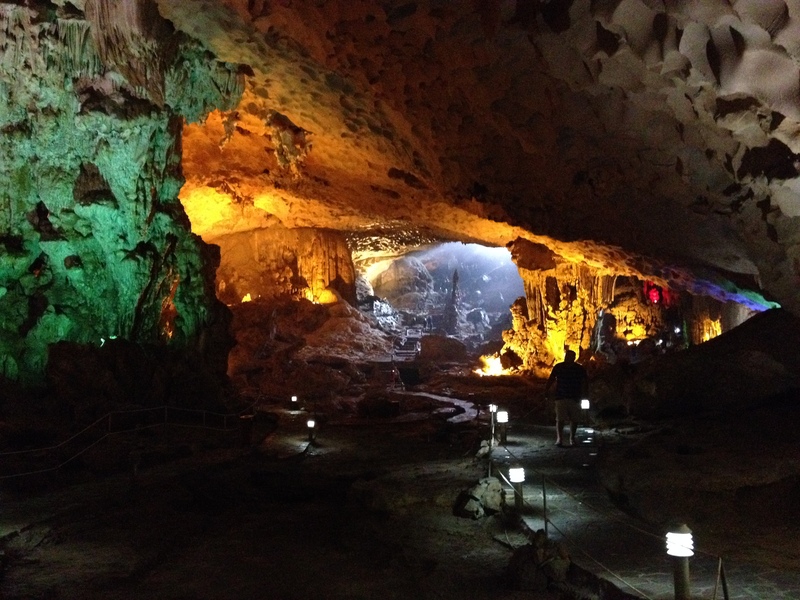 North Vietnam is famous for its UNESCO World Heritage site, Halong Bay. We booked a 2 day/1 night trip with Dragon Cruise with a night aboard a ship. We were picked up at 8.30 am and we drove three and half hours to Halong Bay. On the way there our driver conveniently needed to take a ‘rest stop’ at a silk and limestone factory for half an hour… We were told to look around to see if we liked anything. 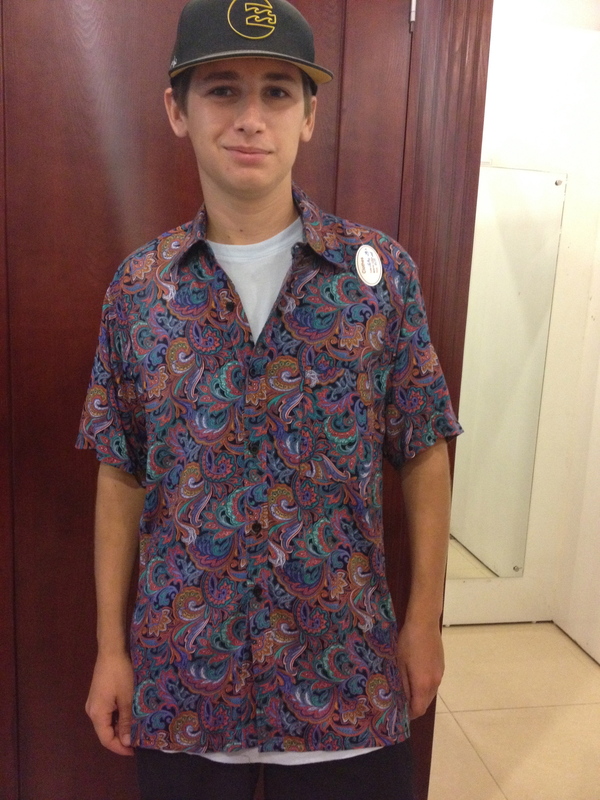 Kyle wanted to buy this shirt at the ‘rest stop’. 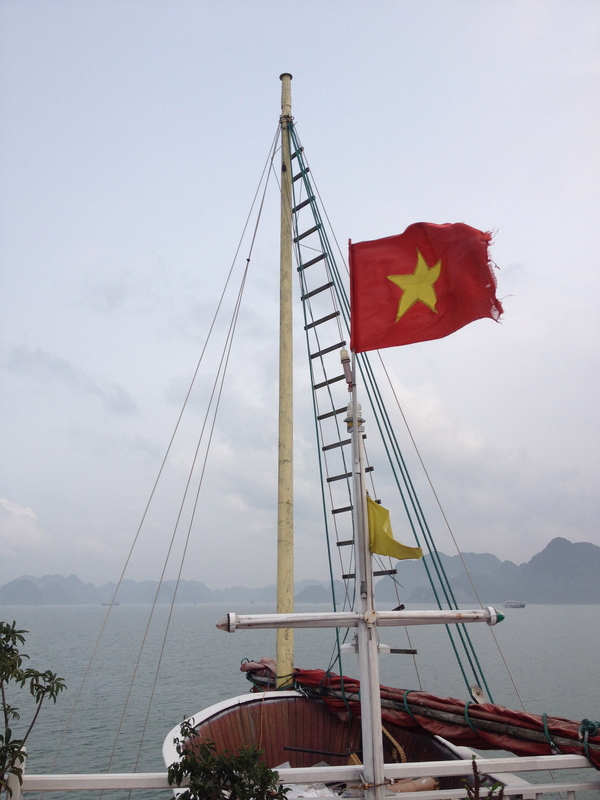 We finally arrived at Halong Bay port where we took a long tail boat to the boat where we’d be spending the night. When we arrived on the ship we were given a free welcome drink of lukewarm tea and then we were given the keys to our cabin. Our cabin was actually pretty nice and looked vaguely like the pictures in the brochure! Since going on we on this gap year we’ve learnt to take everything you’re told or shown with a pinch of salt. 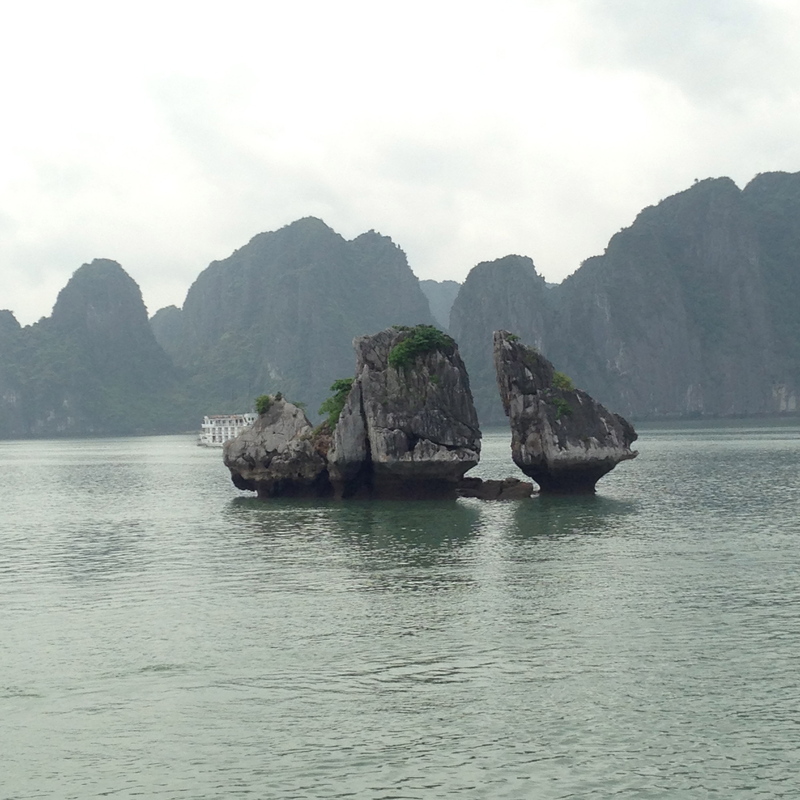 We had a nice lunch aboard the ship and then cruised along Halong Bay taking in the beautiful scenery. 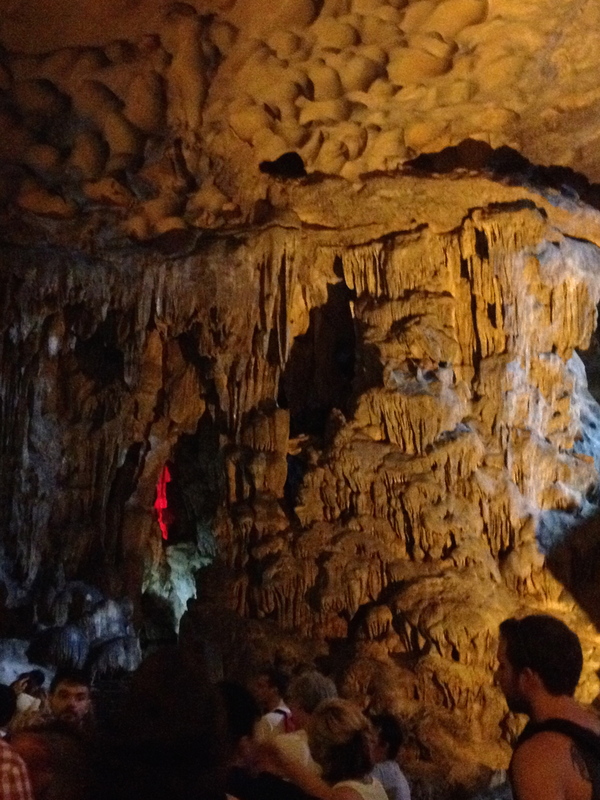 We then made a stop at ‘Amazing Cave’ which was actually pretty amazing. It was absolutely huge and our guide had obviously been here many times as he kept pointing out stalactites and stalagmites that looked like a couple kissing, a fat buddha, or a chicken… It was all very amusing and our group enjoyed coming up with ridiculous ideas of what the rock formations looked like. After the cave we were stopped at a beach for an hour for ‘sunbathing and swimming’. The water was absolutely filthy though from all the boats and sewage. Halong Bay is beautiful but it’s being destroyed very, very quickly by all the tourists. 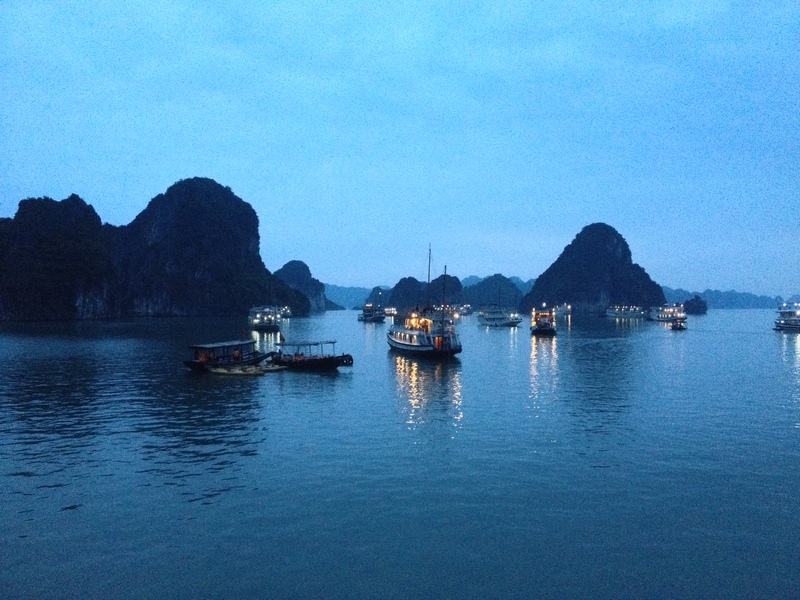 The guide said he hopes that there will be an increase of a million tourists visiting Halong Bay in the coming years! 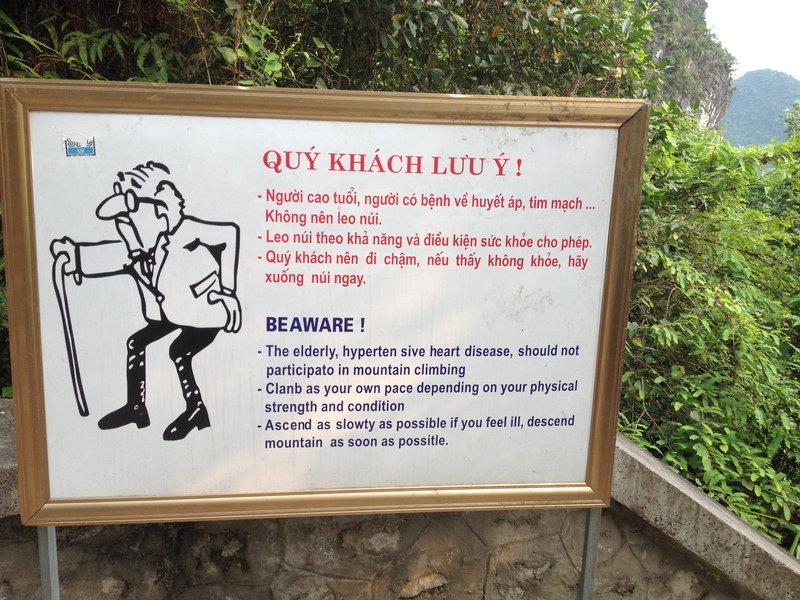 I couldn’t think of anything worse for Halong Bay. What really made the trip though was all the different people we met and their stories from their travels. There were about 20 people on our boat from all corners of the earth – US, South Africa, Australia, Canada, Singapore, Germany, Holland and France. There was a 36 year old Australian guy who told me that he was having a midlife crisis and decided to quit his job and travel for a year. 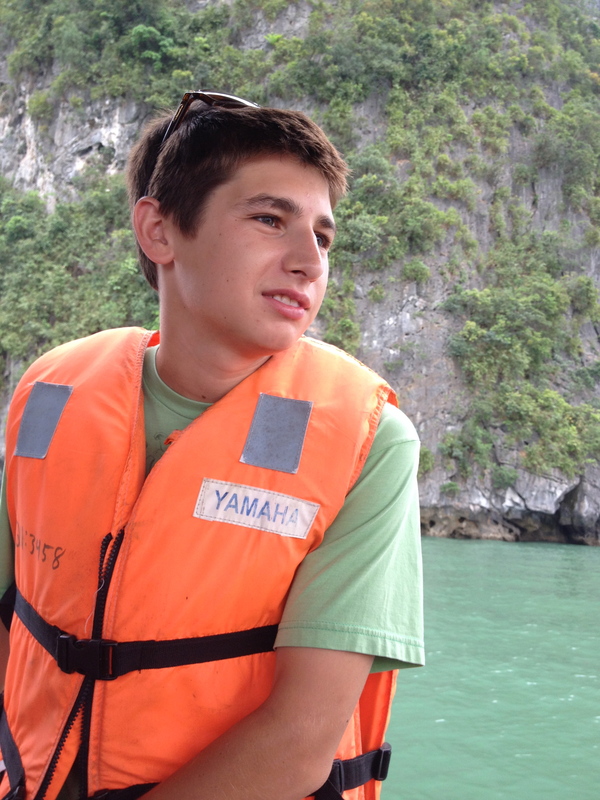 There was also a group of Americans with some pretty wild tales of their travels in South East Asia. They told us how they went to a shooting range in Cambodia and how for $10 extra they could shoot an AK47. They decided to do it and were told to wait 10 minutes while they prepared the AK47. The shooting range then apparently brought out a duck and told them to use it as a target for the AK47. They were apparently a bit hesitant about shooting a duck, but they decided to do it. Apparently the Cambodians then took the dead duck and then fed it to an alligator. It was a really horrible story actually. The food on the boat had been a bit hit and miss. 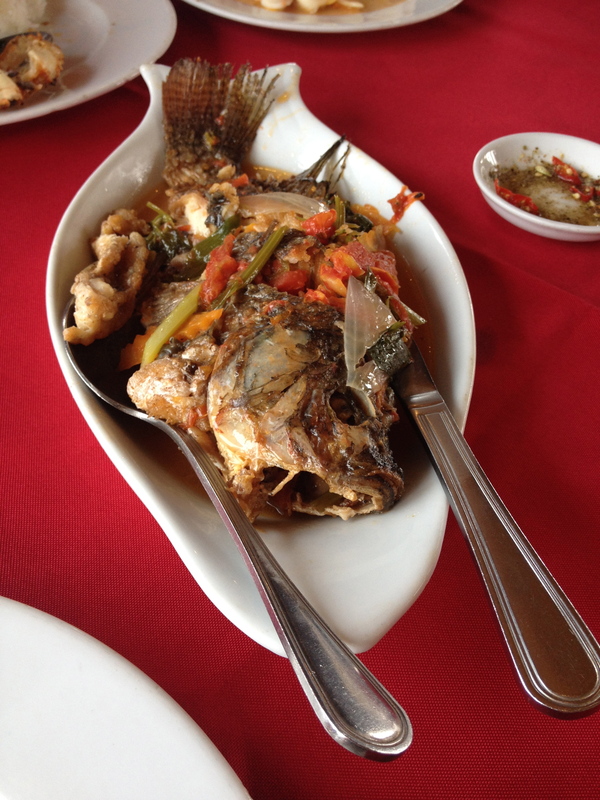 They’d bring out small portions of fish and meat and then a huge bowl of rice. We felt it was really stingey given the price we’d paid for the cruise. Breakfast, however, the following morning was a hilarious affair. We were served a small plate of cut up frankfurter sausages and something that resembled an omelette to share between four of us, and then the biggest pile of toast I’ve ever seen. They put like 24 slices of toast on a plate for a table of four! 24 slices of stale toast. The guide then went around asking everyone if they enjoyed their breakfast and one of the American guys told him it was ‘the most amazing breakfast I’ve ever had’, which made me chuckle. 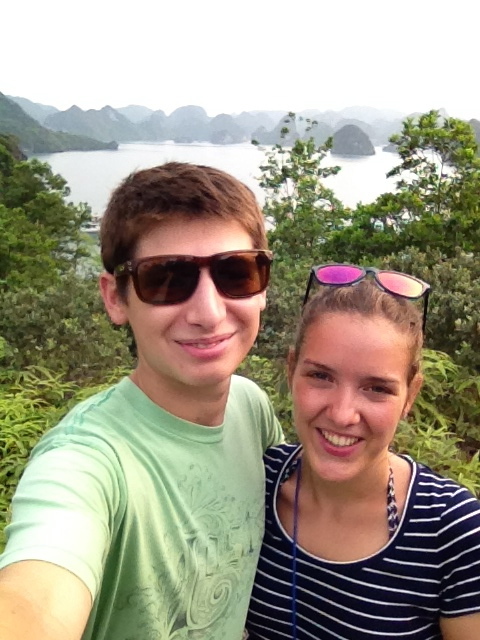 All in all we had a lovely time in Halong Bay!